This multi-purpose stacking armchair by KFI is the solution for many of your seating needs. With a streamlined frame made of 11-mm solid steel rod, the chair exhibits practicality and strength. 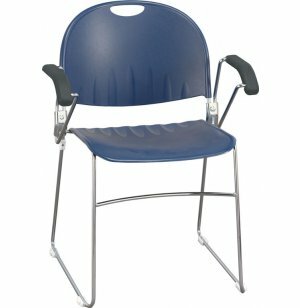 Injection-molded, textured polypropylene seats and backs are easy to maintain and wipe clean with no trouble. A contoured seat and back provide comfortable support. 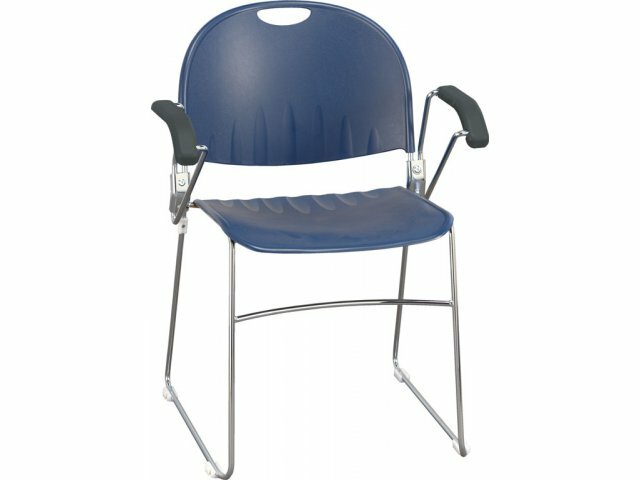 You can move this chair around as often as needed, for it is equipped with white protective floor glides to protect hard surface flooring against any damage. This chair is also outfitted with permanent ganging in order to arrange many of them side-by-side in straight rows. Versatile: Multi-purpose armchair is designed to satisfy all of your practical seating needs. Permanent ganging allows many of these chairs to be grouped quickly into neat rows. Durable: Sturdy frame of 11-mm solid steel rod, will hold strong under tough use. Low maintenance: Seat and back are made from injection-molded textured polypropylene, which wipes clean easily. Comfort: Contoured seat and back for full sitting support. Built-in arms with comfortable arm-rests. Convenient: Chairs stack 6-8 high. Options: Optional tablet arm available - call us at 888-793-4999 for pricing.